You can increase the security of your websites by adding two-factor authentication to your ManageWP login process. If you’ve enabled this option, you will be required to input a verification code (which will be sent to you via SMS and/or email), in addition to entering your password. This prevents any would-be hackers from gaining access to your site through means of brute force attacks (or simply guessing your password). 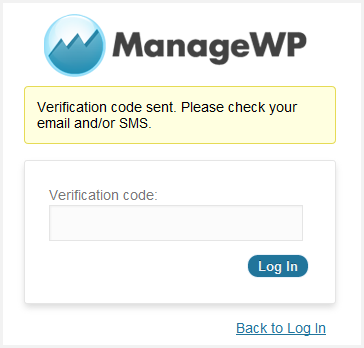 Furthermore, if you receive an email or SMS with a verification code and you didn’t try to log into your ManageWP Dashboard, you’ll know that someone else has attempted to do so. To set up two step verification login to ManageWP, hover-over your Username (top right corner) and go into Settings > Advanced. Scroll down to Two Factor Authentication. Choose whether you want to receive your verification via email or both. Note: SMS Two Factor Authentication is available only for our Business plan. Your account is now even more secure. Next time you log in to ManageWP you will be asked to complete a second step. Input your code and you’ll have access to ManageWP!